This past year or so I’ve learned that writing is a lot like gardening, for me anyway. I love plants, and I tried my damndest to be a nurturing, green-thumbed plant momma. Unfortunately, I used to kill literally everything I touched, which was 3 hanging plants inside, a couple of standing plants (those deaths were more due to the cats chewing on them), an entire herb garden, potted trees, and cacti. Yes. I killed a cactus. Well, two actually. Yet somehow, now, I am the proud mother of a thriving succulent, Elysium, boxed leaf Euonymus, a tomato plant, a Croton, and a tree. What is the secret of my newfound knowledge? Let them do their thing. Only help them out (water, soil) when it looks like they need it. Letting them be was something I didn’t want to accept before. I wanted to fix them before they were broken. I didn’t give them a chance to know what thirst was before I smothered them with my love. so it can breathe? Like a good port. Like a first-born child on their first day of school (nobody cares by the second one, right?). This is why we have to walk away from our work. I don’t know yet how much I mutilated that short story, because I’m afraid to look at it, but I think I might have done something akin to the time I killed one of my plants by giving it Gatorade as a plant food substitute. What? It’s got sugars…electrolytes. Okay, that was my early green-thumbing-it days, people. And it was like 4 drops! How was I supposed to know plants were intolerant to Cool Blue Gatorade? Anyway, here are 5 ways to free your inner bard without the invasive, mouth-breathing editorial projection of ourselves in our ears–or was smothering mother the metaphor we were going with?–destroying something before it has the chance to live. 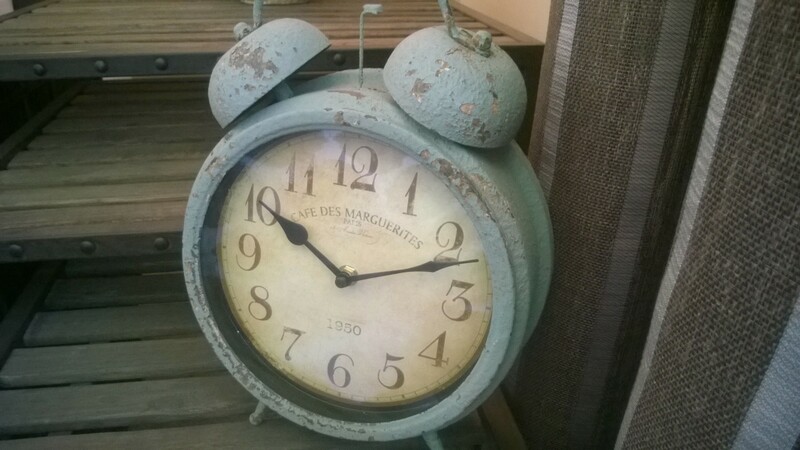 • Timed-writing: I am that naughty writer that reads what I just wrote before continuing on. It’s a problem. Timed-writing helps though, because I feel the crunch and just let my fingers fly on the keyboard. It has the potential to unearth things you might have otherwise censored if you were allowing your inner editor to fill your writing space with his onion breath. • Free-writing: Do this in conjunction with the first one or without a timer. It helps. Seriously. • Write long-hand: Something about this method of composition, also, discussed here, opens up creativity channels you never dreamed you could access. When writing like this, you are more likely to not only be more concise with your writing because of the hand cramps, but more natural and less likely to go back and brave your horrific handwriting (is that just me?) to reread, risking premature editing. • Music: One word, two syllables: Pandora. Be careful with that Dubstep though. You don’t want this to happen. • Imbibing? Just kidding. Unplug: This may not seem relevant, but hear me out. My inner editor jumps out all the time—“what’s the word for that again? Look it up” or “You should probably know a little more before you start writing about that, Poser”—taking me away from my work. If you shut down access to the web and all the many distractions that come with it, or at least restrict yourself, you set yourself up for unhindered writing time. With Facebook, Tumblr, Pinterest, Instagram, and Twitter constantly pulling on your attention, you will return to your writing and reread what you just wrote to remind yourself what the deuce you were doing, which leads to unwanted editing. See the connection? Recently, I developed an addiction to Twitter as I have started to understand how great of a platform it is for writers to connect with each other. But it’s time to set a limit on Twitter usage of once a day for less than an hour, ideally. I’ll let you know if I make progress with this. So unplug. Silence your phone and tell the others in your house that you’re going away for a while. Or, it could be as simple as hiding distractions on your screen. 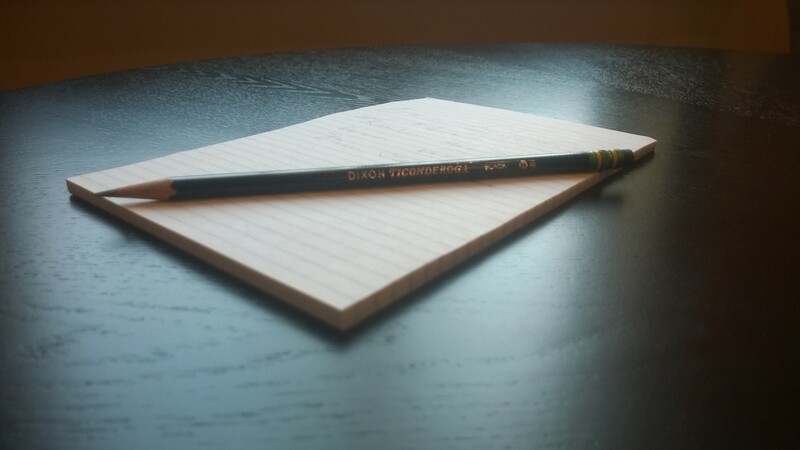 I found this free app called Poe that clears everything from your screen while you write. I already have Scrivener which does that too, but Poe boasted a word count and timer feature I got all aquiver about. You have to scroll over the charms and click the word count charm to see the time clock and word count goals, which I guess is kind of good since you’re trying to avoid distractions anyway. Scrivener has been unable to replace Microsoft Word in my heart as my old standby word processor, for whatever damn reason, but Poe is nice when I really want to block everything out. Beware the wonky formatting. Have any tricks to add to shut that snarky inner editor up? Add them in the comments. Or if mine helped you see the light, let me know. 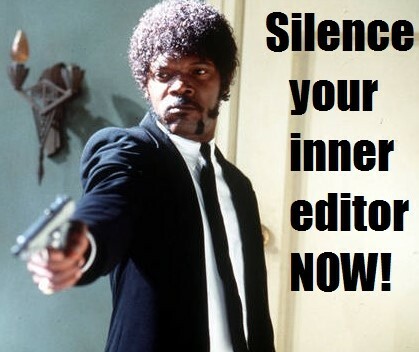 Whatever you do, get a handle on that inner editor now, or Samuel L. Jackson will find you. This entry was posted in Fiction, Methodology, Non-fiction, Process, Random Musings, Technique, Time Management, Writing and tagged distractions, editing, free writing, gardening, humor, imbibing, long hand writing, microsoft word, poe, scrivenor, social media, submissions, timed writing, unplug, writing. Bookmark the permalink. Wavelength. I dig it. I’ll add yours to mine too 🙂 Glad you liked it. Good post Davis! I can’t contribute much. I killed my inner editor a long time ago. Or maybe I was never born with it? It’s like not having a gallbladder. You’re sure it does something important, but you continue living on without it anyway and get really sick when you eat greasy food. Wait? What were we talking about? Can you ask your inner-editor-assassin to pencil me in? This is good timing for me! It’s funny, but I go back and forth as to whether or not this is a struggle for me. Sometimes it never even crosses my mind. Other times (like now) it randomly resurrects itself and I have to learn to conquer it all over again. It’s like a freaking hydra or something. The big difference for me is that my inner editor tends to be preventative rather than disruptive, so my best cure is to simply jump in and start rather than dallying. The longer I dally the more the whispers get in and the harder it becomes to start. It is so like a hydra! What an apt metaphor. Yes! Preventative. My inner editor also gets me before I can even set pen to age, or fingers to keys. Jumping right in helps, but often I’m telling myself that I need to clean the kitchen first, or clear my writing space, or check up on social media (dallying, in other words). It’s like your post “Where Do You Go When the Doubt Monsters Come?” Thanks for commenting, Annie! Sorry for the late reply, Peter! Thanks for the props on my analogy (however foolish I was for even having such an analogy). Thanks for reading and for the reference to your post. I enjoyed it.